The adoption/invention of the bow and arrow transformed societies around the world. In spite of its importance, archaeologists struggle with pinpointing when and where the bow first emerged. 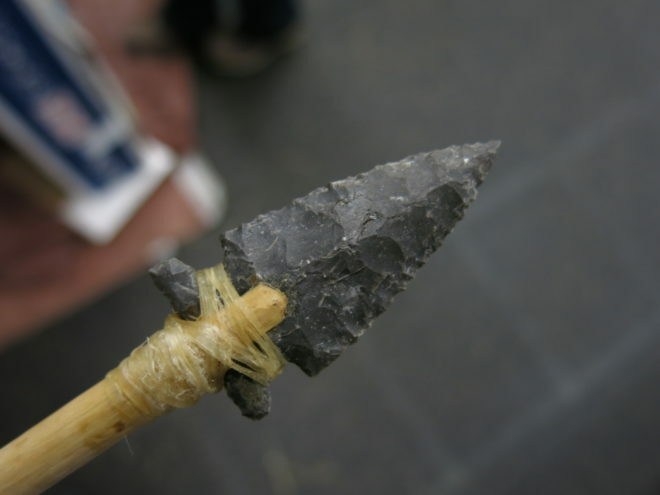 Archaeologists typically associate the bow with small triangle points. This video explores the possibility that large stone projectile points can serve as arrowheads. In eastern North America, the Meadowood is one such point type. Come check out a study of their performance when fired from a hickory self-bow! Cool project. Awesome way to learn more about prehistory! Very cool video! Just wondering, what was the distance that the arrow was shot? Thanks! The machine was positioned at 10 yards. In our part of the Middle Atlantic, the radiocarbon dates on Meadowood points and early triangles overlap, as do other side-notched varieties. And then there’s Jacks Reef….